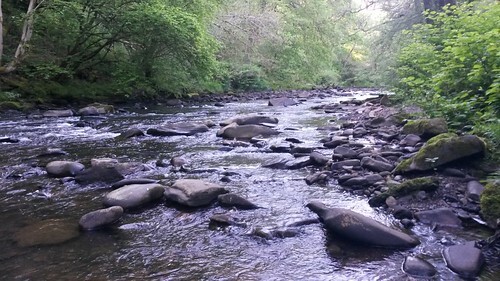 If you enjoy camping and have had or are entertaining thoughts about a stay in South Wales then I’d encourage you to read this post because, as we discovered over the Bank Holiday weekend, staying at Lone Wolf Campsite offers a truly unique experience. This was only the third occasion on which I’d been camping. 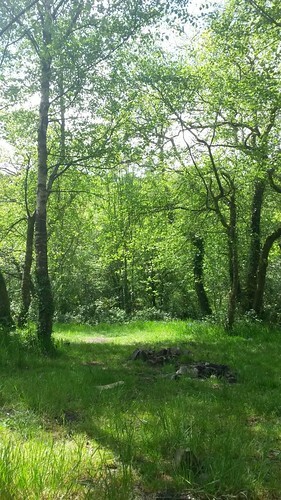 In July of last year, I went to Dorset and stayed in a field that was surrounded by woodland. A month later and I attended the Green Man Festival with another friend, where we were almost trampled on by late-night passers by in search of the toilets and their own tents. It was at my friend’s suggestion that we try camping at Lone Wolf. Even reading the website, I could see the appeal and the prices were attractive as well. 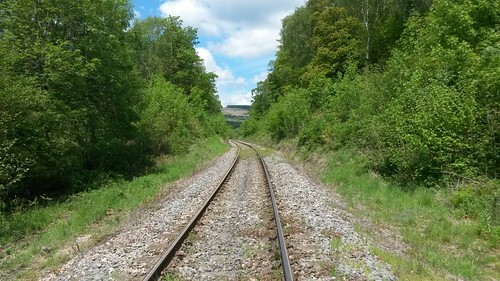 It wasn’t as close to the Brecon Beacons as another destination I could’ve chosen had I been venturing off alone but then, this weekend was also about the shared experience. We arrived at the campsite a little later than intended – after a last-minute dash for kindling, only to be told by several store assistants that it “wasn’t the right season“; then, there was the backlog of traffic trying to cross the Second Severn Bridge and then another slog as we neared our motorway exit a few miles away from Swansea. Fortunately, the site owner (Ian) didn’t mind that we were late and was very kind to explain what the site was about, where to find the various facilities and what we could expect (the site was already close to maximum capacity when we arrived). 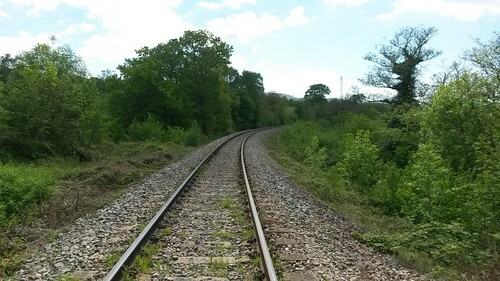 So, at Lone Wolf, you have a standard field for pitching tents and caravans, which is close to the amenities… But the real experience comes from crossing over the railway line (we didn’t see or hear a single train over three days) and venturing out in to the eighteen acres of woodland. From here on, there are no set pitches. 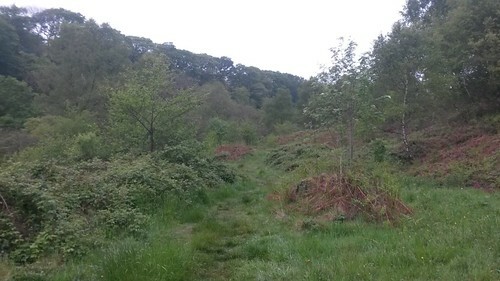 A combination of paths lead you up in to the woods along higher ground. 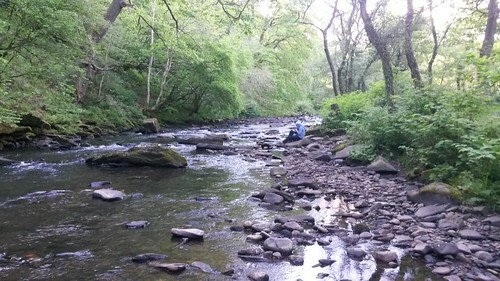 While heading downhill leads you alongside the River Dulais, which cuts nearly through the site. This is also private land and so, you don’t have to worry about ramblers like myself stomping through your porridge or cooked breakfast! Before we’d arrived, I’d prepared myself to be camping within a reasonable distance of other campers, as you would expect to find at most camp sites. 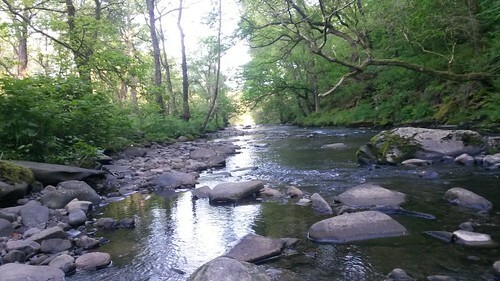 Certainly, if you’re eager for a pitch beside the river then you do need to arrive before the weekend begins as those spaces fill up very quickly. Finding the site from the A4109 is fairly easy and, once you’re in, Ian will probably share with you (as he did with us) a shortcut down a brief, private road that’ll enable you to avoid many of the bumps, drops and wobbles encountered on the way up the main farm drive. But I am glad that my friend was determined for us to have a sense of our own private space and, part way up the hillside, we did find that. View from our tent, looking downhill. We could hear the occasional voice along with the sound of running water but we found our own haven and I can only think of one occasion over the weekend where any other campers crossed a path that resided within ‘our land‘. 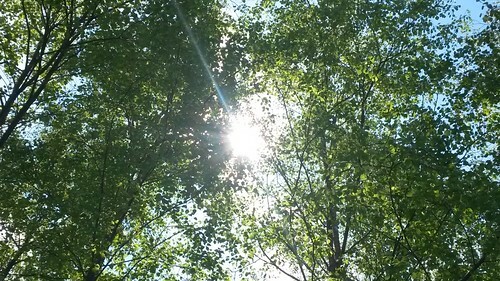 Even waking up to a cloud of midges each morning, the moment you opened your tent… It was bliss. 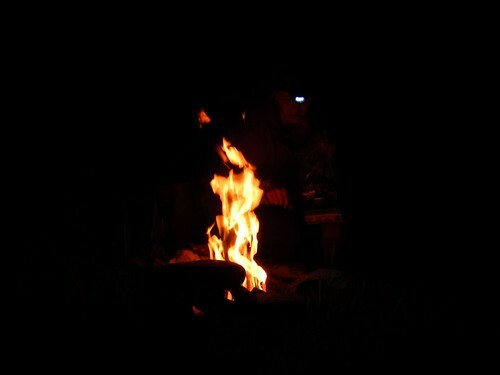 On that first night, after a late walk across the mountains that saw us arrive back at the camp site (via. Tesco) a few moments before 22.00, we built our first fire and cooked a very late-night meal. I say we but, my friend deserves all the credit! Rediscovering our pitch from the car, with only torchlight to accompany our empty stomachs, was more challenging than we’d anticipated… All that matters is that we got there. We made a fire and we were fed. It’s all down to the kind of experience you probably will not get from other campsites. 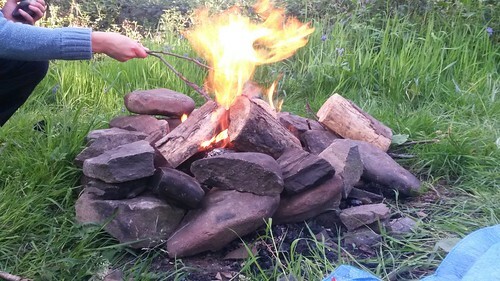 We had to supply our own kindling and there are stones available in most locations for you to enclose your flames but Ian does sell reasonable bags of firewood on-site (£5 and my friend suggests they’re a fruit wood – but for a cold that plagued me last weekend, I would probably have concured). Elsewhere, you’ll find separate water for drinking and washing up, hot showers, a wash room, portaloo toilets and I even spotted a kettle in the kitchen area, right next to the freezer! 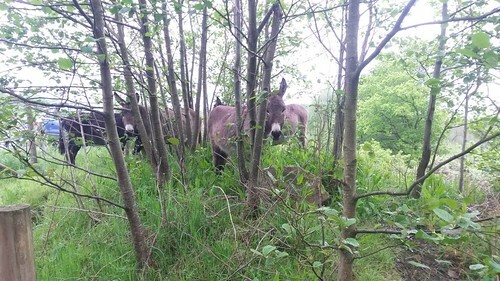 In a field beside the car park, we noticed donkeys. If ever you’re taking a mountain bike though, don’t leave the handlebars within Eeyore’s reach! 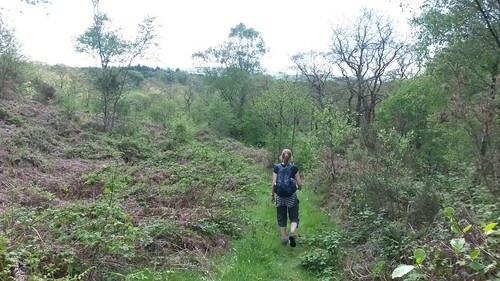 Our first day had been exhausting in ways, with the ninety-minute drive from Bristol, the desperate search for kindling, a longer-than-expected hike around the mountains (not forgetting the forty-five minute drive each way) and then the concern of finding our tents in the dark. Day 2 was more of a chilled out experience, being our last (and only) full day at the campsite. We had time for breakfast. Five-minutes down the road, we visited a National Trust place (more on that tomorrow). 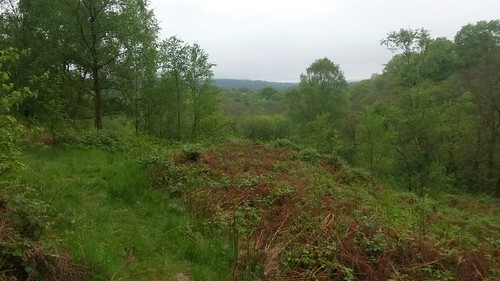 From there we could head in to Aberdulais for food supplies at one of the local supermarkets (there is no such luxury within walking distance of the campsite). After lunch over the stove, we time to relax, to read and chill-out, to paddle in the river – all before lighting a brand-new fire for our evening meal. Cooking over an open fire was a new experience for us both (although, once again, the full credit must go to my anonymous friend). 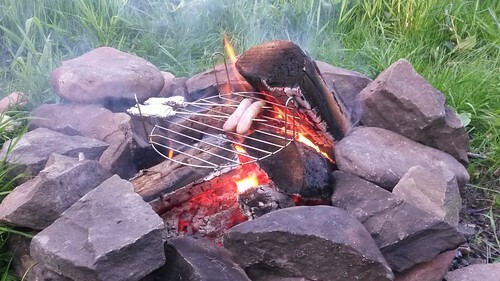 I’d bought along the high rack from my halogen oven and it did a good job of these hot-dogs, after much tinkering and balancing across the wood and rocks. Inevitably, this was our last night and, with much of the second bag of firewood still to burn, we enjoyed the simplicity and shared the warmth until there was nothing left but for the stars peeking through the trees overhead. It was an experience to fall in love with. A way of life that maintains a consistent pace. An adventure in its own. One I would highly recommend to others. One that I hope to relive again in the future. Come Monday morning, we were missing a few home comforts (a bed, settee and a personal shower) but as I arrived home around 18.00 on Monday evening, it was like I had suddenly blinked and woken up. The dream was over and no matter how soon I went back to sleep, I was never going to be able to recapture it. 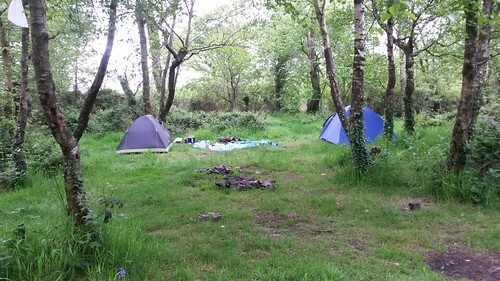 I’ve not first-hand experience of wild camping but I can only imagine this is as close as you’re going to get without losing the few mere essentials of water-based facilities. Sounds like a great campsite, I’ll add it to my list of possible places for next time I need a weekend escape!